Following last year's deal with Starbucks, Square announces that it's bringing its hardware, software and services to another trendy shopping location, Whole Foods. Updated from 10:45 a.m. to include comments from Whole Foods CEO in the tenth paragraph. NEW YORK (TheStreet) -- If you thought mobile payments were going away, think again. They're about to get bigger. San Francisco-based mobile payments company Square has signed a deal with Whole Foods Markets (WFM to bring Square Register and Square Stand to select Whole Foods stores around the country. Users also can use their smartphones to pay with Square Wallet, making shopping for goods that much easier, faster and convenient. 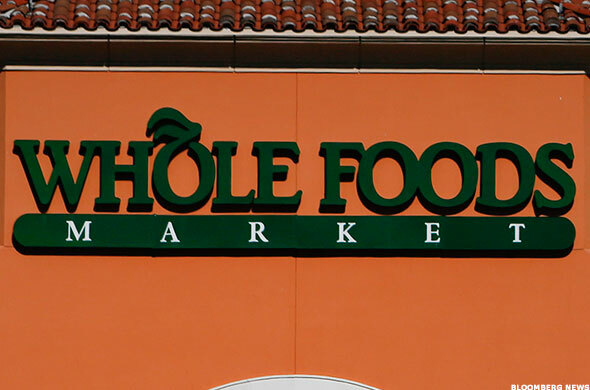 Whole Foods has approximately 350 stores around the country, and a press release issued Tuesday didn't say how many stores would be part of the initial deal. It did mention that several Whole Foods locations will act as "lab stores," allowing for more testing to improve the customer experience, and respond and react to the changing needs of shoppers' habits. Venues inside Whole Foods, such as sandwich counters, juice and coffee bars, pizzerias, and beer and wine bars, will allow customers to skip the usual checkout lines for those goods, and thus reduce wait time for customers, as well as potentially increase sales for Whole Foods. Shares of Whole Foods were higher in Tuesday trading, gaining 0.95% to $55.48 ahead of first-quarter earnings. "Together with Square, we'll deliver options to expedite checkouts, and we look forward to developing new concepts to further simplify and improve grocery shopping," said Walter Robb, co-CEO of Whole Foods, in the press release. "Square's forward-thinking vision and technology makes them an ideal partner to create a convenient, responsive experience for our customers." Square Stand, which was unveiled last year, is already used in seven Whole Foods Market stores around the country, including stores in Austin, Texas, New York City, Florida and the San Francisco Bay Area. Square CEO Jack Dorsey noted that both companies are focused on creating an amazing shopping experience, and this deal focuses on that. Both companies share similar values, which makes the deal between the two companies all that more likely. "With Square, Whole Foods Market will enable commerce in more parts of their stores with easy, accessible tools that showcase the best of what's achievable in the service of retailers and customers," Dorsey said in the release. This is Square's second major deal with a retailer, following the 2012 deal to bring Square's services to the more than 7,000 U.S. locations of Starbucks (SBUX - Get Report). At the time, it was seen as a landmark deal for Square as well as the mobile payments industry, which is expected to boon to more than $90 billion by 2017, according to Forrester Research. "We're looking at new ways to offer seamless technology that will respond to customers' needs and still provide the friendly expertise and service our customers expect," Robb said in emailed comments. The move comes at a time when other companies, including Amazon (AMZN - Get Report) are attacking the mobile payments market. Rumors have suggested that Amazon is working with retailers to offer its Kindle tablets to retailers for a credit-card payment processing setup, similar to what Square has done with Apple (AAPL iPads and iPhones. increased 6.6%," according to the company's fourth-quarter press release. With 367 Whole Foods Market stores in the U.S. and several more on the way, this gives Square the potential to expose its brand to that many more customers. As of May 2013, Square was handling an annualized $15 billion in payment transactions, though that number has since been boosted to $20 billion, according to a report from The Wall Street Journal. Based on a 2.75% flat fee, that would put Square's annual revenue at around $550 million. However, a good chunk of that, perhaps as much as 80%, goes to Visa (V, which owns a stake in Square, and MasterCard (MA.